What is The Power Play In Football? Power is a play which requires “gap” scheme blocking with a pulling guard to kick out the defensive end. Once the hole opens up, a fullback or a tight end will block a linebacker big on big. We’re going to examine the power play from different personnel groupings. If you’re unfamiliar with personnel groupings, take a look at our short write up to understand how different players create different formations. To completely understand the power play, first you must learn the “gap scheme” rules. In short, the offensive line & tight end will be blocking any player in their gap away from the play, also known as a “down block”. A down block is a leverage block which (oddly enough) doesn’t need a whole lot of force to successfully complete the block. 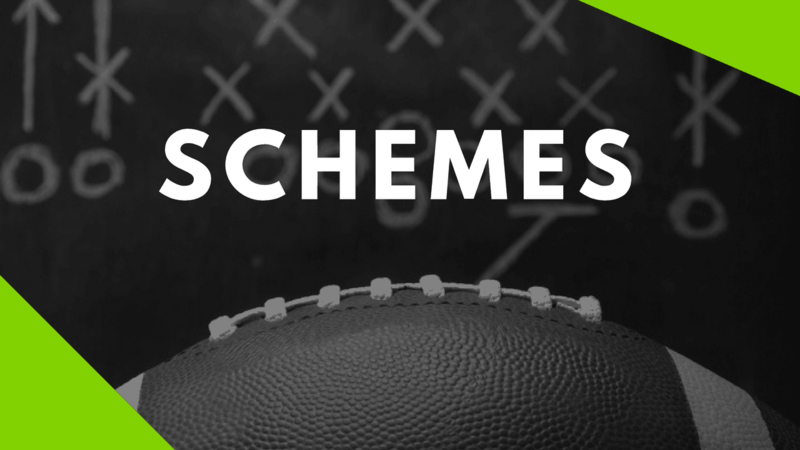 Learn more about our gap schemes and how they can be implemented into your offense here. 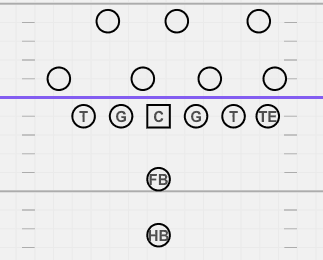 In the diagram below, we’re going to be blocking power from 21 personnel – meaning 2 running backs and 1 tight end. The defense we’re going to use for the example will be a standard 4-3 with an Over front to the tight end. We’re going to use the I-pro formation with the fullback and half back stacked behind each other. When running the power, it’s all about angles and approach for each block. Especially for the full back and pulling guard. Every player not involved in the kick out or pull blocks, are “gap” blocking away from the play. 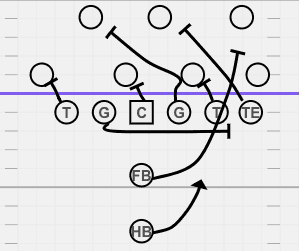 Typically coaches will have their guard-tackle double the 3 technique to the play side, or they will follow their “gap” rules and go for the backside linebacker. 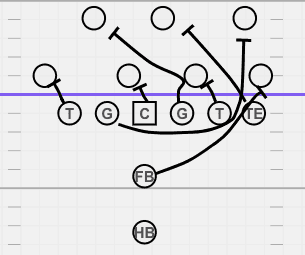 We diagramed it above with the double team on the 3 technique, and slide off to the middle linebacker. Variations of the power play that we’ve seen is a kick out block from the backside guard, and the fullback blocking the outside linebacker. This variation gives a better angle on the kick out block and let’s the fullback run straight for the linebacker. We’ve diagramed this version below. Below is a video version (if you learn better through video and explanation) from xzandos.com on blocking the power. What version of power do you run from 21 personnel? We’d love to hear in the comment section below! As the game has become more athlete centric and spread out, offenses started to adopt inside and outside zone schemes. However, coaches slowly started to adopt the old school power play, into the new school finesse systems. From spread personnel, instead of using 2 running backs and 1 tight end, we’re going to diagram in 12 personnel (1 running back and 2 tight ends) or 11 personnel (1 running back and 1 tight end). Just like we used the fullback to kick out the defensive end, here we’re using the H-back to kick him out. The other players are following their “gap” rules and down blocking away from the play. The backside guard will pull and lead up the hole to the line backer. Similar to the alternate example above, we switched the kick out block to the backside guard and had the H-back lead up through the hole in the diagram below. Teams have gotten creative and run power from 12 personnel, having a tight end and an H-back into the game. Below are some cutups from Chip Kelly’s power game when he was with Oregon. 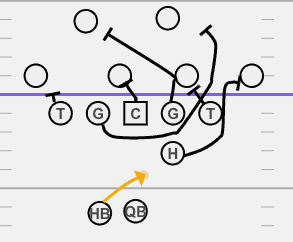 Another variation of power from the spread is using a skill slot player to kick out a defensive end. New England Patriots use this variation from time to time with Julian Edelman motioning from the slot to kick out an outside linebacker or defensive end.. This gives teams the flexibility to still run power from the spread, forcing the defense to fit runs with defensive backs, which is not ideal. How do you run power? Do you run it from 21 or spread personnel? What are your key coaching points when running power? Let us know in the comment section below! The power play, when executed properly, is extremely tough to stop. The first thing to look at, is how the team is blocking the power. One technique is disrupting the tight end or tackle that is trying to down block on the middle linebacker, by pushing him or getting hands on him. Disrupting the lead blocker/kick out block is also important. Closing the hole that the running back can run through, will often make him bounce laterally or put his head down for a 2-3 year gain. Aggressive play from the linebackers and squeezing down the hole from defensive ends will help clog up the power play. What’s The Difference Between Power Play And Power Scheme? 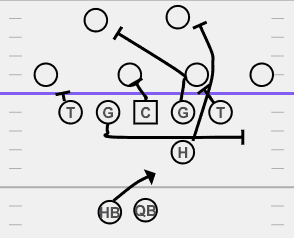 The power play is a gap scheme play which involves players down blocking away from the play, one player to kick out the defensive end, and one player to lead block for the running back. The Power scheme, also known as “big on big” blocking, requires lineman to double team and remove the defensive lineman off the line of scrimmage. Do You Need Big Lineman To Run The Power Play? No. Most of the blocks made in the power play are from leverage when executing a down block. It helps if the kick out and lead block are from physical players who can drive a defender out of the way, but not necessary.